More pics and vid at link. ... 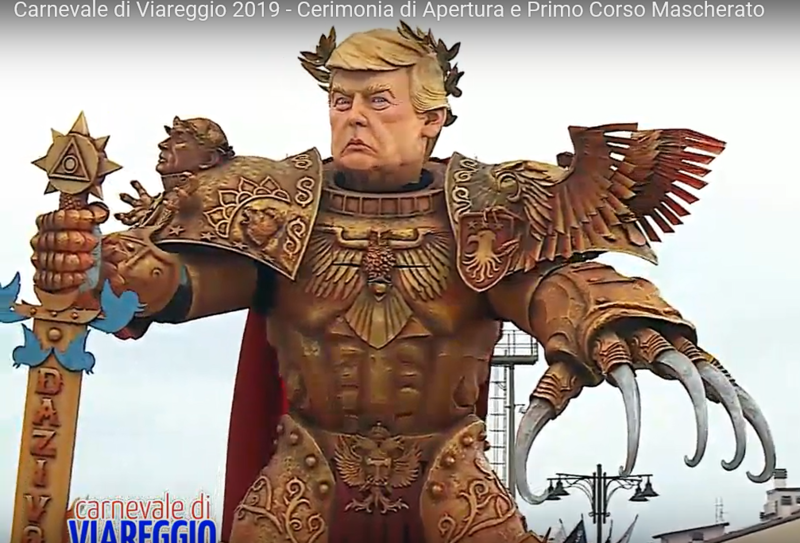 The Carnival of Viareggio, described as “world-famous” by Medium.com (the website chosen by Jeff Bezos for his j’accuse manifesto against the National Enquirer) dates back to 1873, and has established itself as the venue for featuring amazing giant figures. It takes place in Tuscany, a wealthy area that is a magnet for tourists worldwide. ... Don’t you love the Twitter sword that he carries? Trump’s supporters here in the states have dubbed this caricature “God Emperor Trump” because of its uncanny resemblance to the “God-Emperor of Mankind,” a character in the popular tabletop fantasy wargame Warhammer 40,000. “The Emperor of Mankind is the immortal Perpetual who serves as the ruling monarch of the Imperium of Man, and is described by the Imperial Ecclesiarchy and the Imperial Cult as the Father, Guardian and God of humanity,” a Wikia fan page notes. And this “Father, Guardian and God of humanity” looks just like the Italians’ caricature of Trump. ... The globalists realize that this is a worldwide phenomenon, one directed squarely at them and the transition they have wright on countries everywhere. The last thing they want is for Americans to understand that President Trump is THE global leader of a populist movement that is growing, is pro-America, and has already toppled statist governments. Damn, that's awesome. I would be flattered! I wonder if he could buy that and use it in 2020?! Macy's Thanksgiving Day Parade? "Progressive" heads exploding all over, particularly NYC? What the statue creator was explain the Trump was brandishing a sword that represents the U.S. economy that he is using to lay waste to other countries (didn't say which) instead of missals . Rough translations of the words on the sword is F.U. but it's a play on words. And we get an FU for our trouble of protecting these ungrateful louts? What a deal! Don't forget that Italy has a fair number of Socialists . Yeah, for a while there they changed governments more than anybody else. Actually....I believe that "F.U." in Italian is "La Funcula". But...my Italian is pretty rusty. Regardless...President Trump should put that image on his website and send out a Tweet to announce it! The Lefties will be scurrying for their safe spaces like roaches when the light comes on! I rely on Libertas for help with my Italian But you could oil it if need be. Yeah I dunno about that sword...the Goolag translator thinks it is Bosnian and says "lifestyle"...seems stupid to me but that's Goolag for ya. As for Italian...most popular languages...I do try to learn all the naughty words, just in case...but I don't get to use them much and forget some. But I thought that particular phrase was vaffanculo, si? Anything with "La" in front is "The", maybe that one is like a "WTF"? You're probably right! As I said, my Italian is pretty rusty. I used to travel to Italy a couple times per year on business. I would stay for a week or two at a time but...that was almost 20 years ago. It's a beautiful country and the Italians are a wonderful people. Many Italians speak at least some English. My business partner there has two children (girls) and they start English Language classes in the first grade and it continues through out their primary education. Most of them also speak French and German. It sort of puts our kids to shame in that regard....although...our school kids score the highest in Self-Esteem. So...we've got THAT going for us! I used to stay in Lake Como in Northern Italy. My partner's factory was/is in Corano which is outside of Milan. I used to take the train from Como to Corano and back each day. A tip for travelers....outside of the usual touristy spots, men and women use the same public restrooms. That took a little getting used to but...after a few days, it becomes obvious that it's no big deal. Everyone "minds their own business". But still....for an American, it is strange to be standing there peeing in a trough in the floor and have some girl walk in and start washing her hands at the sink which is less than a foot away! My longest stay in Italy was one trip where I spent 3 weeks there. It was weird when I started dreaming in Italian! Another traveler's tip: IF you plan to visit there bring only black clothing...otherwise, you're going to stick out like a sore thumb. On my first trip to Italy I took my girlfriend with me. We also traveled to Rome for 5 days. It was a hoot! Visited the Roman Senate, the Collosseum and the Vatican . I stood in the center of the Sistine Chapel and stared up at Michelangelo's ceiling. It was awesome! WE went dancing at night clubs, threw coins into the Trevi Fountain, did some shopping at the Spanish Steps..all the touristy stuff! If you ever go, you should see Rome. It's breathtaking. The locals all recommend Florence as a must see. If I ever go back, that'll be my first stop! When we were there, Italy was still on the Lira. At the time the exchange rate was 1800 Lira per One US dollar. When we went to Lugano for the day, we had to exchange our Lira for Swiss Marks..and then back to Lira when arriving back in Italy again. It was really confusing! Now, however, they're all on the Euro, so it's easier. I always flew Alitalia Airlines. Back then it was $450.00 Chicago to Milan..round trip! It was actually cheaper than flying Chicago to L.A. 8 1/2 hours over and 10 1/2 back. Long trip! But worth it. Solo on the sword it says "DAZI VOSTRI" the play on words is Cazzi Vostri The straight translation is your dicks to the natives it means eff you. Besides the guy that made the statue said so in his interview. How do I know this you may ask the answer is I was born in Sicily so I'm fluent. I only made it to Naples...on the Navy plan...also Cannes, and hit the French Alps, Monte Carlo and Nice...that was fun. A Med cruise? Shuttling Jarheads around the Med so they could play "hit the beach" at various and sundry places? No, I was part of an airwing deployed on the Coral Sea, our Jarines guarded the weapons vaults and other shipboard security details. Coral Sea changed homeport from Alameda to Norfolk and did a world cruise.